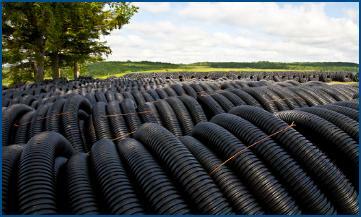 We carry a large inventory of corrugated tubing. 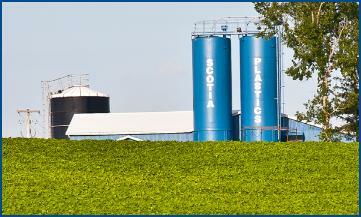 Located in Shubenacadie, Nova Scotia, Scotia Plastics began by extruding and supplying plastic drainage pipe to the local agricultural industry. We added blowmolding capabilities in the early 1990’s to supply the growing needs of regional beverage manufacturers including dairies and bottled water suppliers. Since then, our commitment to quality and reputation for being able to deliver exactly what our customers need when they need it have made us the preferred, and in many cases the exclusive supplier to these companies. 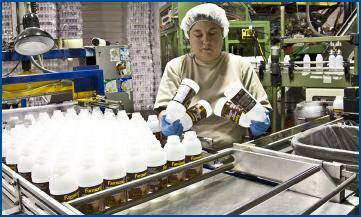 Whether it is food-grade bottles or drainage pipe, our commitment to quality extends throughout the entire company. Our entire operation is ISO 9001:2008 certified. We use only the best quality HDPE plastic pellets as raw material and follow strict quality testing procedures throughout the production process to ensure that our finished products always perform as the customer expects. We pride ourselves in working closely with our customers to understand their needs including planning production runs to match their seasonal demands and storing adequate safety stock in-house to quickly respond to any change in their needs. We manufacture and carry a complete range of industry standard size food-grade and industrial bottles as well as corrugated pipe and tubing. Our experience and expertise also allow us to work with clients to custom develop a bottling solution should the need arise.